For the 1944 film, see Rationing (film). For the human activity of reasoning, see Rationality. Rationing of food and water may also become necessary during an emergency, such as a natural disaster or terror attack. In the U.S., the Federal Emergency Management Agency (FEMA) has established guidelines for civilians on rationing food and water supplies when replacements are not available. According to FEMA standards, every person should have a minimum of 1 US quart (0.95 L) per day of water, and more for children, nursing mothers and the ill. The first modern rationing systems were brought in during the First World War. In Germany, suffering from the effects of the British blockade, a rationing system was introduced in 1914 and was steadily expanded over the following years as the situation worsened. Although Britain did not suffer from food shortages, as the sea lanes were kept open for food imports, panic buying towards the end of the war prompted the rationing of first sugar and then meat. It is said to have in the most part benefited the health of the country, through the 'levelling of consumption of essential foodstuffs'. To assist with rationing, ration books were introduced on 15 July 1918 for butter, margarine, lard, meat and sugar. During the war, average calories intake decreased only three percent, but protein intake six percent. Food rationing appeared in Poland after the First World War, and ration stamps were in use until the end of the Polish–Soviet War. 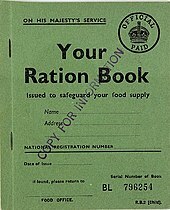 Rationing became common during the Second World War. Ration stamps were often used. These were redeemable stamps or coupons, and every family was issued a set number of each kind of stamp based on the size of the family, ages of children and income. The British Ministry of Food refined the rationing process in the early 1940s to ensure the population did not starve when food imports were severely restricted and local production limited due to the large number of men fighting the war. Rationing on a scientific basis was pioneered by Elsie Widdowson and Robert McCance at the Department of Experimental Medicine, University of Cambridge. They worked on the chemical composition of the human body, and on the nutritional value of different flours used to make bread. Widdowson also studied the impact of infant diet on human growth. They studied the differing effects from deficiencies of salt and of water and produced the first tables to compare the different nutritional content of foods before and after cooking. They co-authored The Chemical Composition of Foods, first published in 1940 by the Medical Research Council. Their book "McCance and Widdowson" became known as the dietician's bible and formed the basis for modern nutritional thinking. In 1939, they tested whether the United Kingdom could survive with only domestic food production if U-boats ended all imports. Using 1938 food-production data, they fed themselves and other volunteers a limited diet, while simulating the strenuous wartime physical work Britons would likely have to perform. The scientists found that the subjects' health and performance remained very good after three months. They also headed the first ever mandated addition of vitamins and mineral to food, beginning with adding calcium to bread. Their work became the basis of the wartime austerity diet promoted by the Minister of Food Lord Woolton. Britons' actual wartime diet was never as severe as in the Cambridge study because imports from America successfully avoided the U-boats, but rationing improved the health of British people; infant mortality declined and life expectancy rose, discounting deaths caused by hostilities. This was because it ensured that everyone had access to a varied diet with enough vitamins. The first commodity to be controlled was gasoline. On 8 January 1940, bacon, butter and sugar were rationed. This was followed by successive ration schemes for meat, tea, jam, biscuits, breakfast cereals, cheese, eggs, lard, milk and canned and dried fruit. Fresh vegetables and fruit were not rationed but supplies were limited. 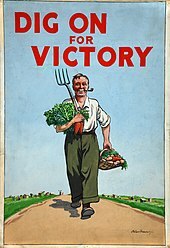 Many people grew their own vegetables, greatly encouraged by the highly successful 'digging for victory' motivational campaign. Most controversial was bread; it was not rationed until after the war ended, but the "national loaf" of wholemeal bread replaced the ordinary white variety, to the distaste of most housewives who found it mushy, grey and easy to blame for digestion problems. Fish was not rationed but price increased considerably as the war progressed. In summer 1941 the British appealed to Americans to conserve food to provide more to go to Britons fighting in the Second World War. The Office of Price Administration warned Americans of potential gasoline, steel, aluminum and electricity shortages. It believed that with factories converting to military production and consuming many critical supplies, rationing would become necessary if the country entered the war. It established a rationing system after the attack on Pearl Harbor. :133 In June 1942 the Combined Food Board was set up to coordinate the worldwide supply of food to the Allies, with special attention to flows from the U.S. and Canada to Britain. American civilians first received ration books—War Ration Book Number One, or the "Sugar Book"—on 4 May 1942, through more than 100,000 school teachers, PTA groups and other volunteers. :137 Sugar was the first consumer commodity rationed. Bakeries, ice cream makers and other commercial users received rations of about 70% of normal usage. Coffee was rationed nationally on 27 November 1942 to 1 pound (0.45 kg) every five weeks. 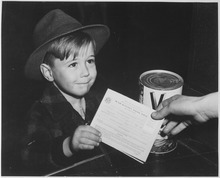 By the end of 1942, ration coupons were used for nine other items. :138 Typewriters, gasoline, bicycles, footwear, silk, nylon, fuel oil, stoves, meat, lard, shortening and oils, cheese, butter, margarine, processed foods (canned, bottled, and frozen), dried fruits, canned milk, firewood and coal, jams, jellies and fruit butter were rationed by November 1943. The work of issuing ration books and exchanging used stamps for certificates was handled by some 5,500 local ration boards of mostly volunteer workers selected by local officials. As a result of the gasoline rationing, all forms of automobile racing, including the Indianapolis 500, were banned. All rationing in the United States ended in 1946. 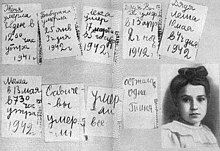 The diary of Tanya Savicheva, a girl of 11, her notes about starvation and deaths of her sister, then grandmother, then brother, then uncle, then another uncle, then mother. The last three notes say "Savichevs died", "Everyone died" and "Only Tanya is left." She died of progressive dystrophy shortly after the siege. In the Soviet Union food was rationed from 1941 to 1947. In particular, daily bread rations in sieged Leningrad were initially set at 800 grams. By the end of 1941 the bread rations were reduced to 250 grams for workers and 125 for everyone else, which resulted in surge of deaths caused by starvation. Starting from 1942 daily bread rations were increased to 350 grams for workers and 200 grams for everyone else. One of the documents of the period is the diary of Tanya Savicheva, who recorded the deaths of each member of her family during the siege. Rationing was also introduced to a number of British dominions, and colonies, with rationing of clothing imposed in Australia, from 12th June 1942, and certain foodstuffs from 1943. Canada rationed tea, coffee, sugar, butter and mechanical spares, between 1942 and 1947. Cochin, Travancore and Madras states, of British India, elected to ration grain between the fall of 1943, and Spring 1944. While Egypt introduced a ration card based subsidy, of essential foodstuffs, in 1945, that's persisted into the 21st century. 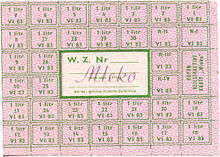 Polish milk ration stamp from 1981–1983. Food was often rationed in Communist countries due to food shortages. Civilian peacetime rationing of food has also occurred in history, especially after natural disasters, during contingencies, or after failed governmental economic policies regarding production or distribution, the latter happening especially in highly centralized planned economies. In the United Kingdom, the rationing system remained in place for many years after the end of the War. In some respects it was more strict after the war than during it—two major foodstuffs that were never rationed during the war, bread and potatoes, went on ration after it (bread from 1946 to 1948, and potatoes for a time from 1947). Tea was still on ration until 1952. In 1953 rationing of sugar and eggs ended, and in 1954, all rationing finally ended when cheese and meats came off ration. Sugar was again rationed in 1974 after Caribbean producers began selling to the more lucrative United States market. Many centralized planned economies introduced a peacetime rationing system due to food shortages in the postwar period. North Korea and China did so in the 1970s and 1980s, Communist Romania during the 1980s, the Soviet Union in 1990–1991, and from 1962-present in Cuba. A good example of this system was Poland. 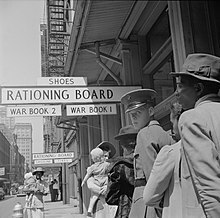 In the immediate post-war period, rationing was in place until 1948. Shortages of food products were common in Poland at that time, but food rations also served another purpose. 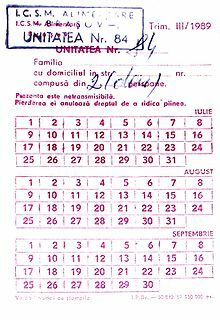 Cards were unevenly distributed by the Communist authorities—leading udarniks, known in Poland as przodownicy pracy, were entitled to as much as 3700 calories daily, while some white-collar workers received as little as 600 calories a day. Rationing covered more than food products. From April 1952 to January 1953 and from August 1976 to November 1985 ration stamps were introduced for shoes, cigarettes, sugar, sweets, liquor, soap, baby diapers, tires, and cars. From 1949 to 1959, Israel was under a regime of austerity, during which a state of rationing was enforced. At first, only staple foods such as oil, sugar, and margarine were rationed, but it was later expanded, and eventually included furniture and footwear. Every month, each citizen would get food coupons worth 6 Israeli pounds, and every family would be allotted a given amount of food. The average Israeli diet was 2,800 calories a day, with additional calories for children, the elderly, and pregnant women. Following the 1952 reparations agreement with West Germany, and the subsequent influx of foreign capital, Israel's struggling economy was bolstered, and in 1953, most restrictions were cancelled. In 1958, the list of rationed goods was narrowed to just eleven, and in 1959, it was narrowed to only jam, sugar, and coffee. United States gasoline ration stamps printed, but not used, as a result of the 1973 oil crisis. Petroleum products were rationed in many countries following the 1973 oil crisis. Aid agencies, such as the World Food Programme, provide fortnightly food rations and other essentials to refugees or internally displaced persons who are registered with the UNHCR and are either living in refugee camps or are supported in urban centres. Every registered refugee is given a ration card upon registration which is used for collecting the rations from food distribution centres. The amount of 2,100 kcal allocated per person per day is based on minimal standards and frequently not achieved, such as in Kenya. According to article 20 of the Convention Relating to the Status of Refugees refugees shall be treated at least like nationals in relation to rationing, if there is a general rationing system in place, used for the population at large. As the British Royal Commission on the National Health Service observed in 1979, "whatever the expenditure on health care, demand is likely to rise to meet and exceed it." Rationing health care to control costs is regarded as an explosive issue in the USA, but in reality health care is rationed everywhere. In places where the government provides healthcare rationing is explicit. In other places people are denied treatment because of personal lack of funds, or because of decisions made by insurance companies. The American Supreme Court approved paying doctors to ration care, saying that there must be "some incentive connecting physician reward with treatment rationing". Shortages of organs for donation forces the rationing of organs for transplant even where funding is available. The concept in economics and banking of credit rationing describes the situation when a bank limits the supply of loans, although it has enough funds to loan out, and the supply of loans has not yet equalled the demand of prospective borrowers. Changing the price of the loans (interest rate) does not equilibrate the demand and supply of the loans. ^ "Food and Water in an Emergency" (PDF). FEMA. ^ Inglis, Julia Selina (1892). The siege of Lucknow : a diary (1892). London: James R. Osgood, McIlvaine & Co.
^ Nevinson, Henry Wood (1900). Ladysmith: The Diary of a Siege (1900). New Amsterdam Book co.
^ Heyman, Neil M. (1997). World War I. Greenwood Publishing Group. p. 85. ^ Hurwitz, Samuel J. (1949). State Intervention in Great Britain: Study of Economic Control and Social Response, 1914-1919. pp. 12–29. ^ a b Beckett, Ian F.W. (2007). The Great War (2 ed.). Longman. pp. 380–382. ISBN 1-4058-1252-4. ^ a b Nicol, Patricia (2010). Sucking Eggs. Vintage Books. ISBN 9780099521129. ^ a b Elliott, Jane (2007-03-25). "Elsie - mother of the modern loaf". BBC News. ^ Dawes, Laura (2013-09-24). "Fighting fit: how dietitians tested if Britain would be starved into defeat". The Guardian. Retrieved 25 September 2013. ^ "Wartime Rationing helped the British get healthier than they had ever been". 21 June 2004. Retrieved 20 January 2013. ^ "History in Focus: War – Rationing in London WWII". Retrieved 20 January 2013. ^ Regan, Geoffrey (1992). The Guinness Book of Military Anecdotes. Guinness Publishing. pp. 19–20. ISBN 0-85112-519-0. ^ Calder, Angus (1969). The People's War: Britain 1939–45. pp. 276–277. ^ Ministry of Agriculture and Fisheries (1946). Fisheries in war time: report on the sea fisheries of England and Wales by the Ministry of Agriculture and Fisheries for the Years 1939–1944 inclusive. H.M. Stationery Office. ^ a b c Kennett, Lee (1985). For the duration... : the United States goes to war, Pearl Harbor-1942. New York: Scribner. ISBN 0-684-18239-4. ^ "Rationed Goods in the USA During the Second World War". Ames Historical Society. Archived from the original on 2014-10-10. ^ "Historic Pittsburgh: Chronology". University of Pittsburgh. ^ "World War II Rationing". Online Highways. ^ "Rationing starts as sugar shortage looms". The Guardian. 9 July 1974. p. 3. ^ "The Nation: The 'R' Word; Justice Souter Takes on a Health Care Taboo". New York Times. 18 June 2000. Retrieved 19 May 2015. Allocation of Ventilators in an Influenza Pandemic, Report of New York State Task Force on Life and the Law, 2007. Matt Gouras. "Frist Defends Flu Shots for Congress." Associated Press. October 21, 2004. Stiglitz, J. & Weiss, A. (1981). Credit Rationing in Markets with Imperfect Information, American Economic Review, vol. 71, pages 393-410. Wikimedia Commons has media related to Rationing. Wikisource has the text of the 1922 Encyclopædia Britannica article Rationing.